What is the role of the worship leader in light of that? The first question was suggested by a friend. And as I considered how I'd answer, I realized that the question of "what is the role of a worship leader" was the obvious follow-up. I'm familiar with those who think that, if our praise is done "right", then God will set up shop in our church. They believe that God is looking for a place for His glory to dwell. Their rationale is from Psalm 22:3, that God "inhabits the praise of His people" -- the only problem being that their entire view is based on the King James Version. Other translations don't have the same wording. It's a bad idea to create an entire teaching based on an out-of-context verse; it's equally dubious to create a theology of worship that is dependent solely on one translation of Scripture. If you were to adopt this mindset -- that God "lives" in the praise of His people -- then the role of the worship leader is to somehow create the ideal atmosphere that God can inhabit. You can imagine the pressure on such a worship leader if things don't go as planned; either they are doing it "wrong", or the congregation must be. Either way, there's going to be some coercive pressure put on just about everybody. I find it odd to think that the same God who graciously sacrificed His own Son on our behalf while we were still His enemies (Romans 5:8) would turn around and be so O.C.D. about with-holding the blessing of His presence during worship unless WE do it "right". We've all experienced those times in worship where the omnipresent God suddenly feels "present" in a way that goes far beyond His usual omnipresence. Many a worship leader has experienced that moment during a song where they are suddenly overcome with emotion as they lead. If we could take a poll at the moment, there would be many similar stories of feeling "something more" of God's presence during worship. These are precious times. And subtly, the role of the worship leader can shift in some peoples' minds (including their own), that somehow recreating similar conditions will produce similar results. The resulting treadmill can become quite performance-oriented as the pressure increases to have regular occurrences of this felt Presence during weekly worship times. However, I think the role of worship leader is actually something entirely different. "When the servant of the man of God got up and went out early the next morning, an army with horses and chariots had surrounded the city. Nothing changed in this scenario except the perception of the servant. The presence of the angelic protection didn't come as a result of Elisha's prayer; it was there all along. The difference was in the ability of the servant to see. The role of the worship leader is not to magically incant the presence of God through the right selection of songs. Nor is it his/her role to whip the people into a frenzy where the level of enthusiasm at least mimics the emotions often felt when God is truly present, in hopes of a new experience. I'd like to suggest that the role of a worship leader is to help people focus their thoughts and hearts on the Jesus who is always present, but not always perceived. Through the Holy Spirit, Jesus may manifest Himself in a wide variety of ways, but the focus of the worshippers is not on what that looks like, but on recognizing and honoring Jesus for who He is. What happens when we worship? 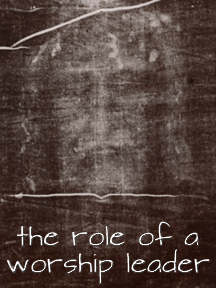 We become more acutely aware of the presence of Jesus who is always present. What is the role of the worship leader? Through song, Scripture, and exhortation, to help pull back the veil of our everyday mundane lives and "see" Jesus afresh. Like Elisha, those of us who lead worship should pray on behalf of our congregations, "Open their eyes, Lord, so that they may see".